You can order the incredible Art of Fermentation, Sandor’s newest title, at the bottom of this page. I first saw the beautiful cover of Wild Fermentation at the Sunnewald Health Food Store in York, PA back in 2003 on a visit to hoop house guru Steve Moore (the Real Steve Moore). A stronghold of Weston A Price philosophy, the staff and customers of Sunnewald were gaga over the new book. I picked up a copy. It blew my mind. It was truly revolutionary. A carefully detailed return to our own culinary history. An important stepping stone to true traditional nutrition. In August of 2004 I asked Sandor to give a fermentation workshop in Shepherdstown, which, as far as I know, was one of he first he did outside of his own community. Sandor arrived just before the workshop in a small pickup that was just crammed with jugs, bottles and crocks, all of which would prove to be filled with amazingly good tasting fermented foods. I think Sandor wondered what he had gotten himself into when we first met before the workshop since I’m one of those really straight looking farmers, you know, like William S. Burroughs, but within minutes we realized we had a common friend in the great Tennessee barefoot biodynamic farmer, Jeff Poppen. Once we knew that, there was not doubt that we were on the same page: dedicated to saving the Earth and the people living on it. I was able to help get Sandor a speaking engagement at the ACRES USA conference that year. I don’t think that anyone on the ACRES staff had actually read Sandors biography before the conference actually began. There was a little resentment that I had apparently crashed this mid-western eco-ag conference by introducing a truly counter culture figure to the podium. No worries. The WAPF members at ACRES already knew Sandor by his work and those who didn’t were completely knocked out by how easy and important to do the art of fermentation is when presented by him. 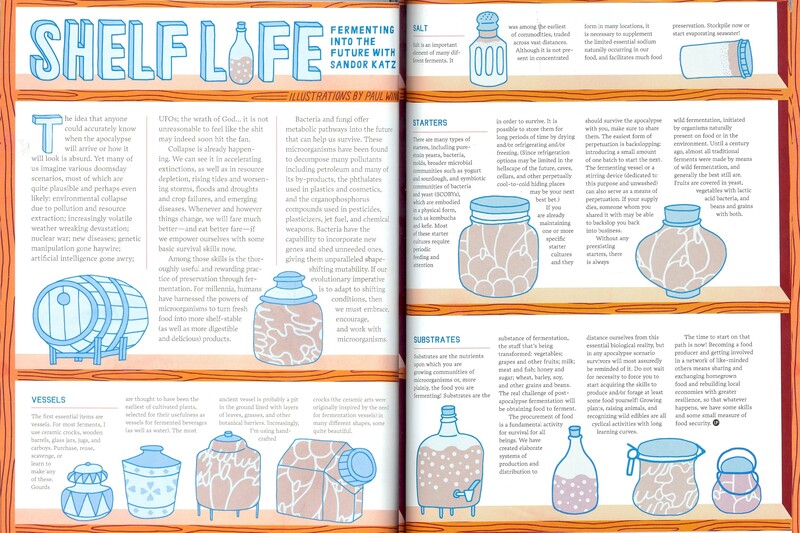 Once you’ve listened to or read Sandor Katz on fermentation, there’s never again a reason to be afraid of killing yourself with home fermentation. From that point on, It’s All Good! The amazing thing about Sandor is his openess and his generosity. He’s not a salesman, he’s activist. When he gives you the gift of his wisdom, it’s not to get something back from you, it’s in the hope that you will take what he’s shares and share it with 10 more people. Keep the food revolution moving. As Sally Fallon said in her review of Wild Fermentation in the WAPF journal, Wild Fermentation is more than a collection of interesting recipes. It's an awknowledgement of the "insidious processes of globalization, commodification and cultural homogenization." Sandor has said, "We cannot resist the homogenization of culture by overpowering it. Yet we must not resign ourselves to it. . . . . Resistance takes place on many planes. Occasionally it can be dramatic and public, but most of the decisions we are faced with are mundane and private. What to eat is a choice that we make several times a day, if we are lucky. The cumulative choices we make about food have profound implications." Weston A Price Foundation's formula for defeating the forces of industrialization in agriculture and food production is to drink raw milk. Another way, according to WAPF founder, Sally Fallon, "Is to eat fermented foods! Authentic fermented condiments and beverages not only return beneficial microorganisms to your digestive tract, they will also help return our wealth to small farms and local communities. Instead of "trickle down," how about "bubble up," where real wealth produced by farmers and artisans leavens the whole mass. "Fermented foods are good for our interior ecology and they can help restore our exterior ecology as well, by increasing the demand for organic foods (only nutrient-dense and pesticide-free foods ferment successfully) and weakening the grip of the food processing industry. When Edward eats the witch's food in the children's classic The Lion, the Witch and the Wardrobe, he becomes her slave. So too, when we eat processed foods, we become slaves to the commodity economy. But foods made by magicians working with the mysterious ferments of the microscopic world-these foods make us healthy and free. Wild Fermentation will serve as a training manual for thousands of culinary Harry Potters, working their magic in the tranquil atmosphere of sacred kitchens." Such is the powerful and yet benign nature of Sandor Katz’ food revolution. fermentation wisdom he had learned, and demystify home fermentation. and eggs, as well as growing mold cultures, and using fermentation in agriculture, art, and energy production, and commerce. The first-ever guide of its kind, Katz has written what will undoubtedly become a foundational book in food literature. but Sandor Katz’s signal achievement in this book is to convince you of its truth. Allan, Thanks for educating all of us. All the broadcasts are great but this is my favorite. I loved the epilogue and just ordered all three of Sandor Katz’s books! Thanks so much, Mary. Thanks for listening to Sandor and thanks for supporting his work and the BDNow! podcast. Did you buy any of his children’s books? I would like to order Sandor Katz’ books via your website but am not finding the links. Could you please direct me. Antonio – I looks like the Amazon gadget it broken. I’ll try to get it fixed in the next few days. Thanks for your willingness to support our efforts here by buying our guests books through our site!